The two pilots that died in the plane crash are identified as Timothy Cline, 43 of Homer, and Drew Welty, 29 of Anchorage. The passenger has been identified as Louie John, 49 of Manokotak. The NTSB's full report is available at http://www.ntsb.gov/investigations/AccidentReports/Pages/AccidentReports.aspx. The Aircraft Accident Report number is NTSB/AAR-18/02. On October 2, 2016, about 1157 Alaska daylight time, Ravn Connect flight 3153, a turbine-powered Cessna 208B Grand Caravan airplane, N208SD, collided with steep, mountainous terrain about 10 nautical miles northwest of Togiak Airport (PATG), Togiak, Alaska. The two commercial pilots and the passenger were killed, and the airplane was destroyed. The scheduled commuter flight was operated under visual flight rules by Hageland Aviation Services, Inc., Anchorage, Alaska, under the provisions of Title 14 Code of Federal Regulations Part 135. Visual meteorological conditions prevailed at PATG (which had the closest weather observing station to the accident site), but a second company flight crew (whose flight departed about 2 minutes after the accident airplane and initially followed a similar route) reported that they observed unexpected fog, changing clouds, and the potential for rain along the accident route. Company flight-following procedures were in effect. The flight departed Quinhagak Airport, Quinhagak, Alaska, about 1133 and was en route to PATG. The flight crew's decision to continue the visual flight rules flight into deteriorating visibility and their failure to perform an immediate escape maneuver after entry into instrument meteorological conditions, which resulted in controlled flight into terrain (CFIT). (4) Hageland's CFIT avoidance ground training, which was not tailored to the company's operations and did not address current CFIT-avoidance technologies. On October 2, 2016, about 1154 Alaska daylight time, a turbine-powered Cessna 208B Grand Caravan airplane, N208SD, sustained substantial damage after impacting steep, mountainous, rocky terrain about 12 miles northwest of Togiak, Alaska. The airplane was being operated as flight 3153 by Hageland Aviation Services, Inc., dba Ravn Connect, Anchorage, Alaska, as a scheduled commuter flight under the provisions of 14 Code of Federal Regulations (CFR) Part 135 and visual flight rules (VFR). All three people on board (two commercial pilots and one passenger) sustained fatal injuries. Visual meteorological conditions prevailed at the Togiak Airport, Togiak, and company flight following procedures were in effect. Flight 3153 departed Quinhagak, Alaska, at 1133, destined for Togiak. Earlier, flight 3153 had originated in Bethel, Alaska; made scheduled stops in Togiak and Quinhagak; and was scheduled to return to Togiak before returning to Bethel, the intended final destination for the day. According to the director of operations for Hageland Aviation Services, Inc., about 1214, he received a notification from the Air Force Rescue Coordination Center (RCC) that it received a signal from a 406 megahertz (MHz) Emergency Location Transmitter (ELT), which activated about 1208 and was registered to N208SD. After accessing the aircraft location data provided by an on-board flight tracking system and discovering the aircraft had been stationary for about 20 minutes, the Hageland director of operations contacted the Hageland Operational Control Center (OCC) in Palmer, Alaska, to verify the information. At that time, the operator initiated a company search for the airplane. 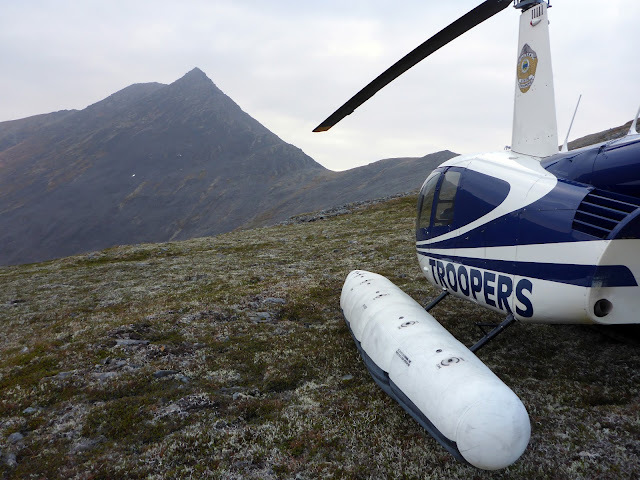 At 1326, the Alaska State Troopers (AST) were notified by the RCC personnel of an ELT activation near the village of Togiak, within the confines of the Togiak National Wildlife Refuge. Shortly before 1430, an AST helicopter was dispatched from Dillingham, Alaska, about 67 miles east of Togiak, to the coordinates associated with the ELT signal, but poor weather conditions kept the searchers from locating the accident airplane until about 1630. Alaska State Troopers were able to access the scene on foot shortly before 1730 and subsequently confirmed there were no survivors. On October 3, the National Transportation Safety Board (NTSB) investigator-in-charge (IIC), along with another NTSB investigator and two Alaska State Troopers reached the accident site. 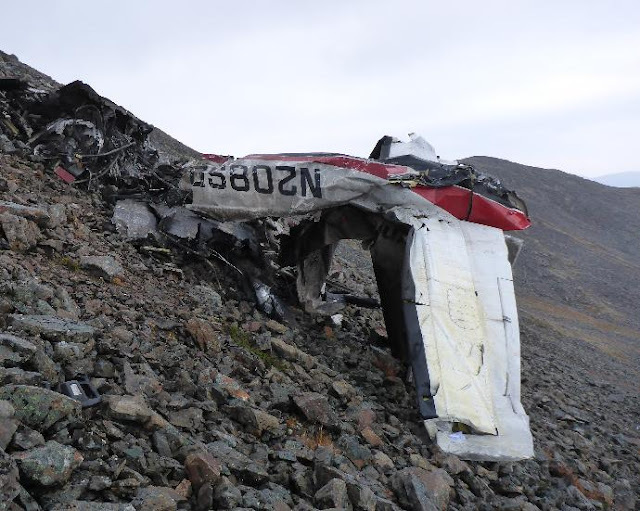 The airplane's fragmented wreckage was located on the southeast side of a steep, loose rock-covered mountainside, adjacent to the Quigmy River, about 12 miles northwest of Togiak. An area believed to be the initial impact point was discovered on the northwest side of a mountain ridgeline at the 2,300-foot level. The initial impact point was located north of and about 200 feet below the 2,500-foot mountain summit. The initial impact point contained fragmented portions of fuselage and two severed propeller blades. 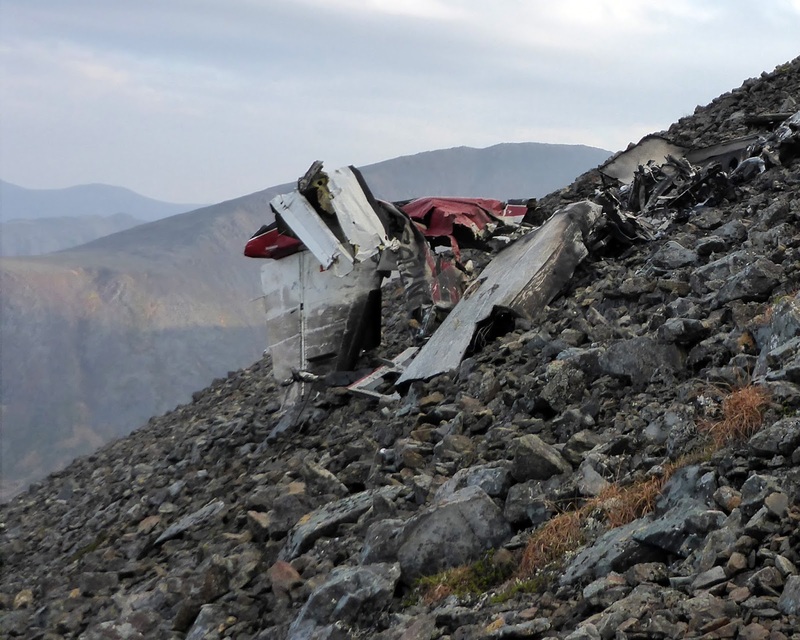 From the initial impact point, the wreckage path extended southeast to the main wreckage, which was located downslope on the southeast side of the ridgeline at the 1,550-foot level. The outboard portion of the left wing had separated and was located about 200 feet further downslope below the main wreckage site. A postcrash fire incinerated a large portion of the fuselage and right wing. The airplane was equipped with a Spidertracks flight tracking system, which provides real-time aircraft flight tracking data. The flight tracking information is transmitted via Iridium satellites to an internet-based storage location at 6-minute intervals. 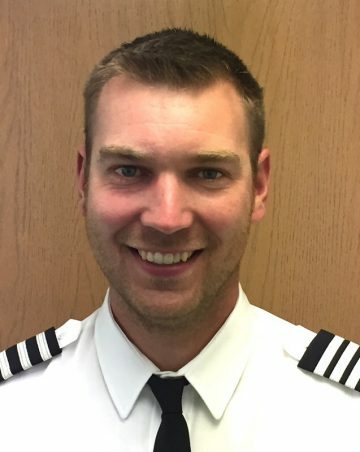 According to the Spidertracks data, the airplane's last known location was reported at 1153, about 19 nautical miles northwest of the Togiak Airport, at an altitude of 1,043 feet, traveling at 144 knots across the ground, on a heading of 140 degrees. At 1156, an aviation routine weather report (METAR) from the Togiak Airport (the closest weather reporting facility) reported, in part: wind calm; visibility 7 statute miles; light rain; sky condition, scattered clouds at 3,900 feet, overcast at 4,700 feet; temperature 45 degrees F, dewpoint 43 degrees F; altimeter, 29.88 inHg. A detailed wreckage examination is pending. The airplane was equipped with a Pratt & Whitney PT6 series engine.